AllegroMedical.com presents The Nature's Best Isopure - Unflavored Protein Supplement. Pure, unflavored. 100 % whey protein isolate. 5,668 mg BCAA's per serving. Lactose free. 2.57g l-glutamine per serving. No additives. Instanized. We're all more than muscle. Pure naked protein. 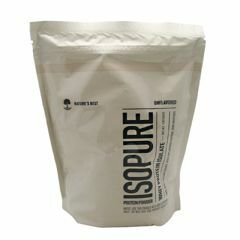 Isopure Unflavored WPI powder contains 26 grams per serving of unadulterated 100% Whey Protein Isolate, stripped of fat, carbs, fillers, sugars and lactose. Easy to add to any food and beverage (hot or cold), and so pure you won't even taste it. Ion Exchange Whey (Milk) Protein Isolate, Microfiltered Whey (Milk) Protein Isolate.